Happy Tuesday everyone.... I hope your week is starting off good. 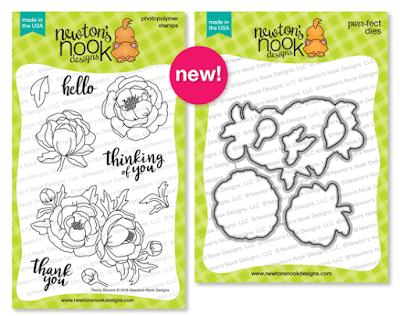 It's Day two of the May Release sneaks from Newton's Nook Designs. Today we are introducing Peony Blooms and it's coordinating dies. I did some watercoloring with Distress Inks on my project. I stamped the image onto a piece of watercolor paper and then I added a blue wash to the background first with Peacock Feathers and Salty Ocean Distress inks. Then I added color to the flower image with Picked Raspberry and Mowed Lawn Distress Inks and an Aqua Brush. I used Fossilized Amber for the center of the flowers. I added the Distress Ink to the craft Mat and picked it up with the aqua brush and dropped it into the clear water I had laid down on the image. This lets the water spread and keep the colors soft so you can gradually build up. You can also heat set your color in between layers. Once the image was dry I stamped the sentiment just below the flower to the Right overlapping part of the floral image. I wanted the sentiment to pop where it was over the flower image so I added some White gel pen around the letters. I trimmed a 1/4" off the Floral panel and added some foam tape to the back. I cut an A2 size White card base and added some Black n' White washi tape along the edge. Then I adhered the image panel flushing it to the Right. Comment on the NND blog and Design Team blogs (see list below)! The winner will be chosen at random from the collective reveal posts. Make sure to check out each of their blogs and comment for your chance to win. You will not know which blog has been chosen so the more you comment on the better your chances are of winning! You have until Thursday May 17th at 9pm EST to comment -- winners will be announced on the blog post on Friday, May 18th. Beautiful watercolor background. Made the peonies pop. Beautiful card. Love how the blue background makes the flowers stand out. So pretty. Love coloring, patterns, and design. Just a wonderful release. Thanks for the inspiration! So soft and elegant, thanks for the inspiration. So pretty. I like the background. Lovely card! Beautiful soft distress water coloring and I love the touch of black stripes on the left to compliment the black sentiment. The peonies are gorgeous! 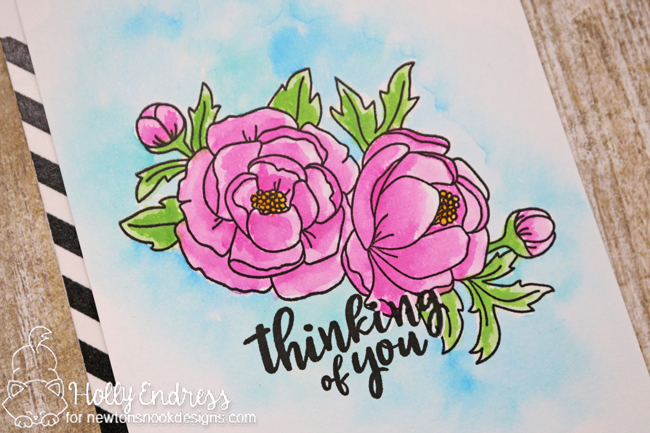 So many ways to color them and include in a card. Love the frame set as well. flowers - really makes them pop. Such a pretty card! :) Love your coloring! Beautiful watercolouring on this gorgeous bloom. Very pretty card!Thanks for the chance to win . 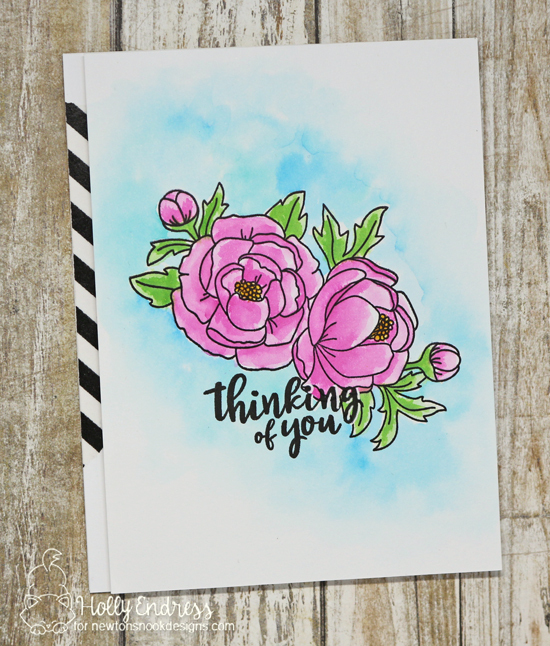 Love these pretty peony flowers! Beautiful card! What a gorgeous colorful card! So inspiring! Love how you have coloured your peonies. Nice addition of the shading around them! Beautiful card! I really like the blues behind the flowers! I also like the black and white striping on the side of the card! with the sentiment also being done in black really pops!